Had a pretty chilled couple of days. Yesterday, I went to Mirakan and got inside this time – I saw the famous little robot in action which is pretty cool to see, another which is borderline creepy and got to step onto a spacecraft. 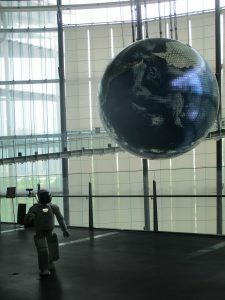 As a whole, the museum is pretty interesting but gets a bit boring when it comes to the physics exhibit. After, I popped to Akihabara again and looked around the shops – floors and floors of anime and various character toys. 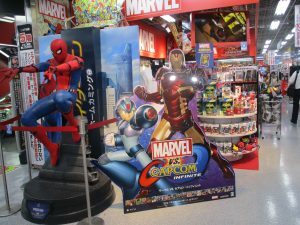 Also went to a massive electrics shop, straight to the toy section – most of my time was spent in the Marvel and Pokemon sections. After, I went to one of the arcades with six or so floors and played heaps of games – probably threw £10 at least away, but it was fun. There’s a few travel blogs that I follow, and every time I visit somewhere new I always check them out before as someone has already been there. 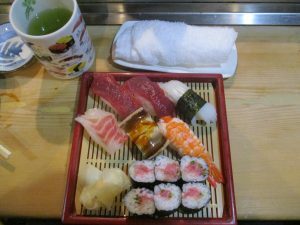 One of the recommendations was to go to the basement in Asakusa main station and try some sushi – it’s such a popular station, but I did not see another white person eating. I ended up in a small restaurant, being served sushi by someone who spoke no English which was pretty neat. In the past, I’ve never really had fish sushi unless it’s salmon as I’m pretty sure that I can’t stomach it too well and I was right – I can handle glass after glass of wine (or I like to think so) but I can’t handle mouthful after mouthful of fish. Truth be told, that’s the way I’d prefer to keep it. Afterwards, I headed to Shinjuku and went to the park there, via a 7-11. There’s this thing, and I’m not too sure if it’s just a backpacker thing or just everyone in general, but in Asia you should go and pick up something strange from there and try it out. You can get whipped cream and berry sandwiches here, but I opted for this green tea dessert and it was so gross it was fascinating. 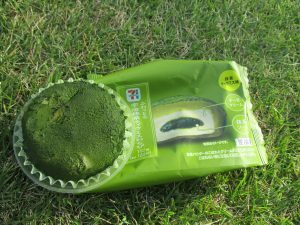 It was a green tea jelly stuffed with whipped cream and dusted with green tea powder, and had the consistency where you had to slurp it to eat it. This evening, I had a ticket for the Robot Restaurant – pretty pricey, but well worth it. Just sat there wondering what on Earth was going on for an hour or so; it just gets to the point where you wonder if it can get any weirder and then it well and truly does. For dinner, I didn’t actually eat at the restaurant because I’ve heard that it’s not worth it so instead I opted to go to Golden Gai, had some Karaage chicken which was pretty good as well as a few other snacks, before heading back to the hostel. Tomorrow, I should be off to Fuji for a day before heading to Kyoto for the rest of the trip, before nipping back to Tokyo to get the flight back. I’ve heard a lot about Tokyo being out there and just crazy which is the opinion of people who haven’t lived in a big city. For me, it has been a lot like London – nothing that I can’t handle, just a bit more crazy, though with that said I have enjoyed it. In hindsight, I probably should have rested a few days from work before coming here, or just not have had such a crazy night when I left work as I have found myself very tired over the past few days. This trip so far has been the reminder that there is more to life than work and my priority should be just having a good time and not worrying about text messages or phonecalls about bloody microherbs on my days off.